It is a delight for me to attend the launch of the Confucius Institute for Dance and Performance at Goldsmiths. This is the fourth event I have attended in the past 10 days relating to Chinese language and culture. The first was at the end of May. I attended the launch of new BA Chinese Studies Programme at Durham University, the third oldest university of England. 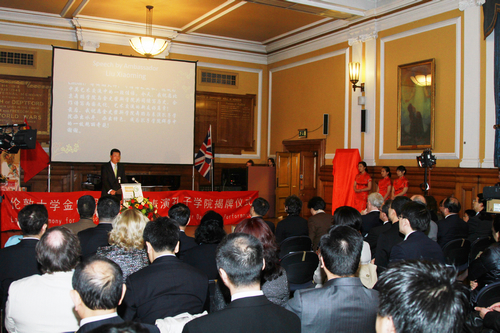 Then last Saturday, I spoke at the launch of the Chinese Language Centre of Wellington College in Southwest London. This Wednesday, I traveled to Edinburgh University. There I addressed the opening session of the conference of European Confucius Institutes and Classrooms. Today the fourth stop of my 'educational trip' takes me here to Goldsmiths. Though these four schools are in different parts of Britain, they are all associated with Chinese language teaching. Another thing they have in common is they are all more than 100 years old. For example, as an independent college of the University of London, Goldsmiths has existed for 107 years. Goldsmiths has a high reputation in China. This comes from Goldsmiths being world famous for its creative and innovative approach to teaching and research in arts. In addition, Goldsmiths has produced many world class artists. Beijing Dance Academy is known as the 'cradle of dancers'. So these two schools have the same specialty and are now brought together through a Confucius Institute. It is an excellent example of win-win. Your collaboration gives birth to the world's first ever Confucius Institute focusing on art. Yet it should be no surprise. This is because Confucius Institutes always stress drawing on local excellence and expertise and aim to have varied strengths. 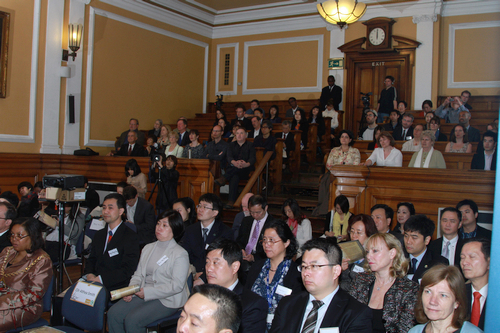 For example, in Britain there are Confucius Institutes for business and for traditional Chinese medicine. They are both the first of their kinds around the globe. The Confucius Institute for Dance and Performance launched today opens a new dimension for Confucius Institutes. It is designed to combine arts and Mandarin learning. Teaching future artists the Chinese language is helping them target the Chinese art market. China is a very large market with 1.3 billion people. That is about one fifth of the world's total population. So, this union created today is a very forward-looking decision. As I said on many other occasions, learning Mandarin is also a process of studying Chinese culture. Art knows no borders. Arts of the West and East should have exchanges and interactions. Better knowledge about Chinese culture will no doubt broaden horizon of future artists of Goldsmiths and enhance their artistic training. I also believe that collaboration of these two schools is of a strategic nature. On top of successful operation of the Confucius Institute, they will engage in full exchanges and cooperation in broader areas of art. I am sure both of them will greatly benefit from such cooperation. You may be interested to know that China and Britain have been linked through classical dance for many years. Over half a century ago when Beijing Dance Academy was founded, its first principal was Madame Dai Ailian. In her earlier time from 1930 to 1939, she studied dance in London for almost 10 years. Her tutors included masters like Sir Anton Dolin, Mary Wigman and Rudolf von Laban. Her experience became a much told story in the history of China-UK cultural and art exchange. As we launch this Confucius Institute for Dance and Performance today, I do hope Beijing Dance Academy and Goldsmiths will write new stories of friendship. Here is a great chance to compose new chapters of China-UK exchanges in culture and art. 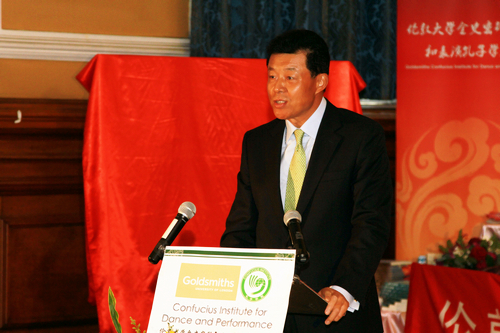 In closing I wish the Confucius Institute for Dance and Performance at Goldsmiths an exceptional success!